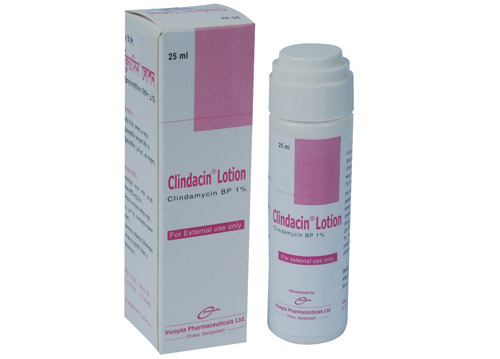 Clindacin Lotion: Each ml Solution contains Clindamycin Phosphate BP equivalent to Clindamycin 10 mg.
Clindamycin is a lincosamide antibiotic used in the treatment of infections caused by susceptible microorganisms. Clindamycin is a semisynthetic antibiotic derived from lincomycin. It has antiacne and antibacterial activity. It binds with the 50s subunit of the bacterial ribosome and inhibits the early stage of protein synthesis. It is highly potent against gram positive and anaerobic bacteria. Clindacin lotion is indicated in the treatment of acne vulgaris. • Skin infections such as erythrasma caused by Corynebacterium minutissimum; rosacea, periorificial dermatitis, folliculitis, stasis, chronic lymphaedema and familial pemphigus. At first wash the face or affected area gently with warm water or soap. Clindacin lotion: When the skin is completely dried (about 30 minutes later) apply a thin film of Clindacin lotion to the entire affected area twice daily. Applied area should not be washed within 3 hours. Noticeable improvement is usually seen after about 6 weeks . However, 8 to 12 weeks of treatment may be required for maximum benefit. Eye, lip or nose contact should be avoided while applying Clindacin lotion. Side effects are usually rare. Possible side-effects may includes skin rash, itching, oily skin, dryness, erythema, burning, change in skin color, diarrhea, colitis, GI disturbance etc. Clindacin lotion is not for oral, ophthalmic, or Intravaginal use. Avoid exposure to sunlight and sunlamps. Wear sunscreen daily. Pregnancy: There is no adequate data for safe use in pregnancy. Animal studies showed no adverse effects on the fetus. Lactation: It is not known that whether Clindamycin is excreted through breast milk following topical administration. However, Clindacin lotion can be used during lactation with caution.